Young Jace holds on to his dad’s hand like a bolt; his curious eyes sweep the sidewalk, and he carefully watches the other children playing next to the building. He has a hard time making friends, says his dad, Jim, and though he is sharp as a whip, he shies away from people he doesn’t know. Jace seems like every other 7-year old, but he is not. Jace is autistic, and his father is a single dad – and together they are residents of A New Leaf’s La Mesita Family Homeless Shelter. 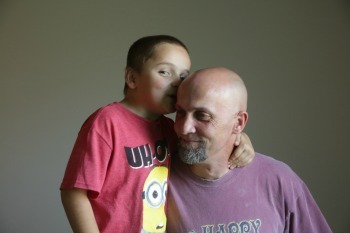 Jim and Jace hold a close bond, and Jim’s struggles to raise his autistic son, while finding meaningful employment and a permanent home have brought them even closer. Jim searched online for any information he could find about autism. He would read well into the night and take careful notes so he would remember everything. He called a national hotline to talk to experts. And he decided to move with his son from his home of Dekalb, Illinois, to Sierra Vista, Arizona. Jim’s biological mother lived there, and she offered to give him support while he looked for a job. So Jim and Jace packed their belongings, and they headed to Phoenix. Upon arriving, Jim used the rest of his savings to pay for a stay at a Super 8 motel. “I was desperate to be in a larger city and find places that could help me and my son,” says Jim. “It was really hard. We were alone in a big city, and I was stressing, knowing I needed to find a job and how could I find childcare for my son – and the money was running out. I felt sick to my stomach. I just couldn't let Jace down." Then a miracle happened. He learned of A New Leaf’s La Mesita Family Shelter. Jim recounts how the staff welcomed him and his son with open arms. Jace, a big baseball fan, was given tickets to see the Arizona Diamondbacks through a donation, and the family attended several games. Jace was thrilled. Through referral from La Mesita, Jim enrolled Jace in the Rainbows Children Center, where he can receive specialized support. And the La Mesita staff helped Jim register with a parent’s group at Arizona Autism United. Jim and his son will be moving into an apartment soon, supported through A New Leaf’s Rapid Re-housing Program. Jim says his son is not acting out nearly as much as before, and Jim says the support network established through La Mesita’s shelter and staff has made all the difference. You can help families like Jim’s find the stability and support they need. A New Leaf is where homelessness ends. Donate today and make a difference!